Group exercise is a rising fitness trend -- Workout organizations like November Project help participants stick with their goals by holding them accountable to others. A year and a half ago, Stein Esser was in a rut. "I was stuck. I was complacent in life," he said. He was struggling with depression, wasn't meeting new people and didn't have a road map for how to shake it. The self-proclaimed introvert described how he procrastinated every day when he came home from work, telling himself he would work out. "I would sit on the couch first and eat a bag of tortilla chips and then just kind of sit there, and then the next thing I know, it's 8 o'clock, and I haven't worked out yet." That's when his sister told him about a new workout group called the November Project. Its members meet weekly outdoors in the wee hours of the morning and push themselves through a mix of high-intensity interval training and body weight exercises. They also play unusual games, such as a form of tag in which you have to do push-ups when caught. Esser said he was cynical at first, and his depression drove a fear of rejection that kept weighing him down. But he took a chance. "It's changed my life," he said. "I've wanted to go to every workout after that." Millions of Americans have made New Year's resolutions to exercise but are chasing that perennial mirage of real workout routines. Esser, with new friends keeping him accountable, has an edge. It's a growing trend. Each year, the American Academy of Sports Medicine releases its Worldwide Survey of Fitness Trends. The group's president, Walt Thompson, says "group exercise" wasn't even in the top 20 fitness trends three years ago, but since then, it's shot up to the No. 2 slot for 2019. Thompson suggests that the millennial generation, often isolated and gazing at smartphone screens, is driving the trend with an unmet craving for human connection. Thompson said the attrition rate for new exercise programs, especially those attended as a result of New Year's resolutions, was about 50% in the first 30 days and almost 80% within 60 days. But when you introduce the accountability of group exercise, especially with modern tools, wishful thinking is more likely to turn into a practical habit. "The compliance rate increases and improves dramatically because we simply have this group dynamic and the social support that's part of being part of a group. "If you're exercising on your own, the only person that you have to argue with you is yourself." At least 49 US cities have November Project groups. They are free for participants, emphasize peer accountability and leverage social media to keep people coming back for more. At the end of each workout, the group leader asks every participant to turn to the person next to him or her, give them a sweaty hug and tell them, "I'll see you at the next one." In the group's parlance, this spoken promise is a "verbal," or a verbal commitment, that you're coming next week. So if you fail to show up, you're giving the group members permission to call you out on social media. 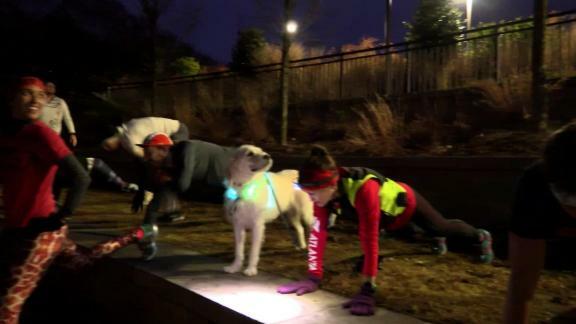 Each November Project group posts weekly photos featuring those who braved the predawn hours to do burpees and lunges and all manner of movements out in public. It's not uncommon for participants to post their workouts on social media with apps like Map My Run, Strava and Fitocracy. Seeing your friends tagged in the photo drives "FOMO" -- the fear of missing out. The November Project is just one of numerous formal and informal fitness groups using social media to make exercise fun and addictive. Through it, Esser has met a group of friends who are now training for a marathon together. "When someone's not out to work out, you notice that and your other members of the tribe are likely to reach out to you and say 'hey, what's going on?' " he said. "And at the same time, if someone is out posting pictures at the bar late at night and they miss a workout, we're also going to razz you for that. Another way to hold you accountable is, we're all showing up at 6 a.m. And you better be there. If you say you're going to be there ... you're making a commitment to push each other."